Last week we released a preview of the Azure Analysis Services web designer. This new browser-based experience will allow developers to start creating and managing Azure Analysis Services (AAS) semantic models quickly and easily. While SQL Server Data Tools (SSDT) and SQL Server Management Studio (SSMS) are still the primary tools for development, this new experience is intended to make simple changes fast and easy. It is great for getting started on a new model or to do things such as adding a new measure to a development or production AAS model. The Azure Analysis Services web designer now allows you to import data models from a Power BI Desktop file (PBIX) into Azure Analysis Services. Once imported to AAS, you will be able to use those models with all of the AAS features including table partitioning. You can import your own PBIX file by following the steps below. An Azure Analysis Server at the Standard or Developer tier. A Power BI Desktop (.pbix) file. 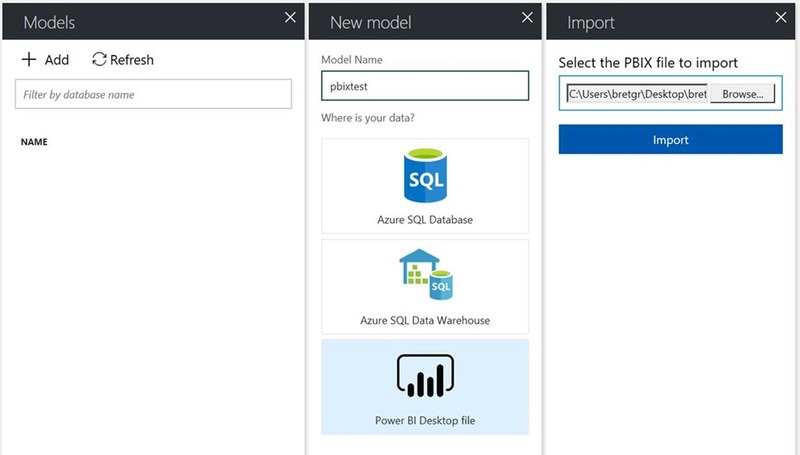 New models created from Power BI Desktop files support Azure SQL Database, Azure SQL Data Warehouse, Oracle, and Teradata data sources. 1. In your server's Overview blade > Web designer, click Open. 2. In Web designer > Models, click + Add. 3. In New model, type a model name, and then select Power BI Desktop file. 4. Browse for the file you wish to import and then click Import. At this point, the model inside of your desktop file will be converted to an Azure Analysis Services file. You can then query this file in the web directly, or open it up in the Power BI Desktop as a live connection. Further edits to the model can be made in the Azure Analysis Services web designer or through Visual Studio.